Photos of 3.2 and 2.8 inch iPhone touchscreens? 4 and 7 inch tablet devices?! Two new iPhone Models (3G and 2.5G) at WWDC?!! To add to the growing rumors surrounding WWDC, today, iLounge.com released images of two touchscreen components that are similar to the current iPhone and iPod Touch components, but are slightly smaller in size by .3 and .7 inches. Also, one Wall Street analyst feeds the fire about an iTablet and sheds light on new iPhones at WWDC. 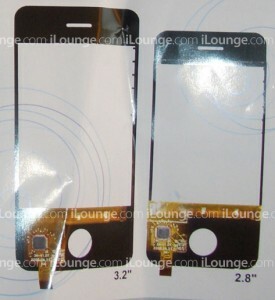 The photos, shown above depict touch components that appear to be destined for a future iPhone or iPod Touch. Taiwanese display manufacturer Host Optical claims they are working with Apple on the new displays and are responsible for the release of the information. The components are described as a “projected capacitance touch panel” with the emphasis that they are superior to the current touchscreen used in the iPhone and iPod touch. According to Host Optical, the new touch components do not get less sensitive over time, are more durable and can withstand water and very humid environments. 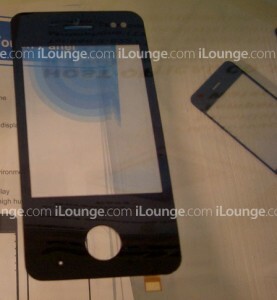 iLounge.com believes these new screens may not be destined for the new 3G iPhone, specifically the 2.8 inch display. iLounge believes that “there is zero chance that a 2.8” screen is going to be in Apple’s first 3G version of the iPhone”; but most likely for a smaller “iPhone nano” or fourth generation iPod Nano. It should be noted that Apple never reveals who supplies components and suppliers rarely admit they are working for the Cupertino company. By releasing this information before product release, Host Optical is violating terms with Apple. Theoretically, anyone can claim that they are suppling components for Apple. Additionally, majority of rumors agree that the new 3G iPhone will have very similar dimensions to the first generation iPhone, with only added tapering around the edges. Also today, American Technology Research analyst Shaw Wu published in a report to clients that 4 and 7 inch touchscreen devices are beyond prototype stages inside Apple. Wu believes that these devices are crosses between the Mac and iPod touch and may be a modern recreation of the Newton MessagePad from the 1990’s. Shaw predicts that the devices will most likely not see light at next weeks WWDC keynote. Shaw Wu is confident that Steve Jobs will introduce two new iPhone models next week; one of them the hotly anticipated 3G iPhone, and another refined version of the current 2.5G model that would be significantly cheaper. He says his information is based from supply chain sources. Finally Wu says that while WWDC typically highlights Macintosh related products, this year may be an exception. Because new portable Macs “most likely won’t be ready for volume production until the September quarter”, this years event will not highlight new Macs. Steve Jobs keynote will kick off at 10AM PST (1PM EST) on June 9th. theiLife.com will be in attendance and livebloging from the keynote here. If you can’t be at a computer, you can still recieve urgent updates (expect about 10-20) to your cell phone via SMS by signing up here.